Welcoming, safe, nurturing and loving. How could it be otherwise? I spent the day with people who felt exactly as I did, devastated and broken, searching for meaning and direction. An entire day of sharing stories, tears, fears, hopes – it was a cathartic experience, and I left feeling hopeful. That hope has been carried on throughout the years, reinforced and strong. My tremendous feeling of release, after the shared stories, after my tears, in a room with a group of people who were strangers to me, and now are friends, very special friends. I felt alive. What about the day or people there was special? This is easy. Rob Fazio. The very first person that reached out to me after my husband died. A stranger to me at that time, he not only held the door for me, he reached out his hand to me and walked with me. Who is better than you, Rob Fazio? By becoming a part of the Hold The Door family, I’ve learned how to live a little bit better, to laugh a lot more, to love with a great heart, and to resurrect the person I once was, only a little bit better. Why would you recommend other people attend HTD Day? When we suffer the loss of someone we love more than life itself, we lose ourselves and search for the meaning in the why. What I remember most about the day is the intimacy of the event and sessions. It really felt like a safe space to dig deep inside ourselves and open up. I loved that it was so conversational. I’ve never sat in a circle and shared experiences and knowledge on such a specific topic before. I am grateful for Keli Fazio’s [a Hold The Door Growth Consultant] practical and research-based information! HTD Day opened my eyes to some of the struggles that someone in the role of a helper can experience. I was able to identify these in my life and understand that they were representative of my role as a helper and not necessarily an indication of something I failed to do as a person or lacked. I learned not to get discouraged when one method doesn’t work or when I don’t get the response I was looking for. It’s not about me ,it’s about them. It was really encouraging, actually. I would recommend other people to attend HTD Day because what you learn and experience can potentially save and change lives. Knowledge is power. I appreciate your organization so much. Thank you for HTD Day. Immediately walking into registration I felt welcomed. Staff was smiling and offered a warm hello. Feeling connected to others, feeling safe. The genuine kindness and respect people had for each other. I left the day feeling uplifted and more lighthearted. While I will always carry sadness in my heart and long for my husband, I learned from others that I can do this, even when I don’t want to. I really felt touched and overcome with emotion when I heard others share feelings they have that I at times thought I was the only having. That evening as I was writing in my journal I was able to say goodbye to some of the feelings that have been counterproductive to my healing. I was able to do so because I learned that what I feel is normal and shared by others. I recommend this program because it gives people an opportunity to connect to others that are also grieving. It is hard sometimes to find someone who “truly gets you.” Here people understand, listen without judgement and offer mutual support. I did not know what to expect. I’d recently lost my husband and wanted some relief. I felt I was being stoic and needed someone/thing to pull off the scab. I needed the release of emotion that I experienced at HTD day. I did feel the relief and I felt it was OK to let the dam burst. I remember the overwhelming sense of warmth, love and concern from the facilitators -the helpers – everyone. They all seemed to really care about me and eachother and made me feel comfortable and safe right away. Same as above, plus the fact that this family is honoring their dad/husband in this way – it is very touching – and using their own adversity to help others. .
HTD has encouraged me to feel that it’s ok to be hopeful about the future, That my life does not end when I lose a loved one – that I can grow and love and learn and experience life in a whole new way and NOT feel guilty about it. I would recommend HTD so that others can learn a perhaps unconventional approach to dealing with loss. Of course there is grief, and that must be dealt with – but that it is ok to laugh and feel joy in the midst of it. I would recommend the seminar to all who have experienced loss. I guess that would be everyone I know….. I have been attending Hold the Door Day for several years now. During this wonderful day, each time, I have immediately felt friendship and acceptance. Upon arriving, I’ve been greeting as part of the family and throughout the day, and now years, I have grown to feel I belong in this group of authentic, positive people who meet to share a connection. The connection we share is that we are human and through this organization we can feel free to share life stories and how those have affected us. What we learn together, most significantly, is how much we all have in common.. ups and downs.. fears.. bad times.. happier times.. We basically grow and learn how to meet life’s challenges with a sense of strength and optimism. Almost immediately, engaging in this organization and event specifically makes one feel like he or she is part of some bigger strength of acceptance, trust, and friendship. I now have many wonderful memories from Hold the Door Day(s). Firstly, when recalling the day, I envision laughter, smiling, togetherness, people talking, sharing, relating. I recall the feeling of hearing and seeing children relate and heal, specifically. No one is left out during this day. Everyone matters and is important to the entire group. Everyone adds to creating a safe and supportive environment and by the end of the day, we have much to celebrate together. The opening, the introductions, always impress me. They have been fun and warm. And the counselors so real and humorous, that it’s inviting and exciting. Everything about the day and the people I’ve met through this organization is special. I am a special-education teacher, so I have been part of some very loving, open events throughout my lifetime. Still, this organization and event exceeds anything I’ve known. I feel that might be due to the fact that we are not there for work or any other obligations. We all attend to specifically share in healing and to grow an environment of trust and support for the day, with the intention of creating lasting friendships and sources of support among who were once strangers. The making of good friends, from strangers is priceless and has left me personally with a perspective that I am never alone in this world, regardless of what I may be going through personally. It is very difficult to write a statement about how Hold the Door Day has helped me. It would be like have to describe why a rainbow or a sunset is beautiful. They are beautiful but who could their beauty in words fully? Honestly, Hold the Door has changed me for the positive. It has made me stronger and the greatest lesson that permeates myself and my life is that I am important. I have learned to respect and love myself, regardless of outward events or situations. The people who run this organization believe in everyone and they are so smart and genuine that they actually build confidence in others. If anyone has lived life as a human, for even one day, I would highly recommend attending this event. Other humans will be grateful for what you can share and you will find out more about yourself, making your life so much fuller. The connections I made with other people, especially the ones in my “tell your story” group. The people in my “tell your story” group had all lost a beloved family member(s) or friend. Our stories of loss had many similar elements that brought us closer together as a group, and made us feel more connected to each other. We were able to share our loss(es) as a group, and not just by ourselves. Because we all need someone to help us cope with the loss of a loved one. HTD offers us that opportunity by connecting with others who have experienced a similar loss. I had such a wonderful time that day, it went so quickly because things were so organized and went so smoothly that we were sad when it ended. The classroom time was the best, I have no idea how they put who into what rooms, but we had the most genuine, wonderful people in our room. I loved the role-playing we did in the room. I had the best time and we accomplished something while doing it. We gave feed back to each other, and I felt better afterwards. The doctor in our room, I have no idea what is name is again, (smile) but he was awesome. Again, every one was sooo nice and sincere why they were there and there was a healing and comforting in the place the whole day. It helped give me the courage to know that I am a good person and it is all right to be me. I was in the initial stages of the separation between my husband and me and it gave me strength. We have separated since then and it gave me the go ahead also to know that I am a good mother and it gave me bonding time with my son and we enjoyed the day together. It was an re-enforcement that this too shall pass and I know that everything is going to be alright and it has been a long and hard journey since then but it gave me the initial strength to do what I needed to do. Absolutely. I really wish I had brought my other son as well who is now 6. He would have loved it. I would love to bring him this year. From the moment we arrived at the Hold the Door event, we were amazed at the sensitivity and caring of everyone involved. The participants were no exception to this, and despite coming from a wide range of backgrounds, we were all able to find common ground, and work together to explore our issues, and to help ourselves, thanks to the gentle coaxing of the professionals from HTD. One of the first things that occurred after we arrived was the separation of myself from my wife, into different groups, based on the perceived need for services, and approaches. That was disconcerting, as we are ordinarily inseparable. But, it turned out that the first group of people we met, who enforced this, were more prescient than a lot of the psychologists who had seen us before. I thank and bless everyone who is involved in this life-saving structure for the emotional well-being of so many individuals who have sustained psychic scars from the 9/11 attacks. I cannot rate this experience of the workshops highly enough, as someone who has witnessed transformations in the trenches of our new wilderness….. Initially, I only knew it was for people who had experienced a loss. I was not looking forward to spending a whole day as I was involved in a Hospice group, but went because I knew my friend needed me to go with her. She had to leave early, and I wound up staying the whole day! I couldn’t believe how well run it was and all the thought that went into it. I’m aware of the difficulty of getting a conference together, and this was exceptionally well done. I remember being impressed by the number of professionals who were there. 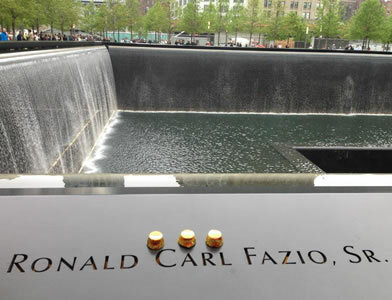 I was especially impressed because it was being held in memory of someone who had lost his life on 9/11. What a tribute! I knew 2 people who died there. I will remember that day until I am no longer alive…. I also couldn’t believe there were no pleas for donations! The connection we all had because of our individual loss. The compassion and caring of everyone. I feel it always helps to be in touch with someone who not only talks the talk but who is walking the walk. It’s easier to express my feelings with people who are experiencing a similar problem. I know I thought I knew how sad someone would feel about the loss of a spouse. I never realized just how sad until I lost mine. Now I dread the thought of friends and family having to go through this processs. To help them better deal with their own loss. My experience at Hold The Door Day was very emotional for me. I spoke about things there that I have never spoke of with others before. It also made me realize that as bad as I thought things were for me at that time, there were others that were going through things that were far worse. What I remember most about the day is how kind everyone there was, especially your Mom. I think your entire family is amazing. The day was made special by the kindness and genuine concern I felt that all involved with the day showed to me. I would recommend other people to attend the day if they are feeling alone in their time of need because being with the people involved with the day let you know you are not alone. There is help out there and people who care.